So for those of you who have been using Profit Rhino for an extended period of time now, you've probably noticed that our in-app quote interaction was slightly limited. There were difficulties with editing saved quotes, deleting old quotes you didn't need, and searching for a particular quote in a long list. Those problems, are now problems of the past. With our newest update, we've taken another step towards having a flawless technician interface for our companies. That being said, with great features comes great responsibility, and our responsibility today is learning how to use these new features. The first feature we'll be learning to use today is syncing and saving your quotes. 1st. 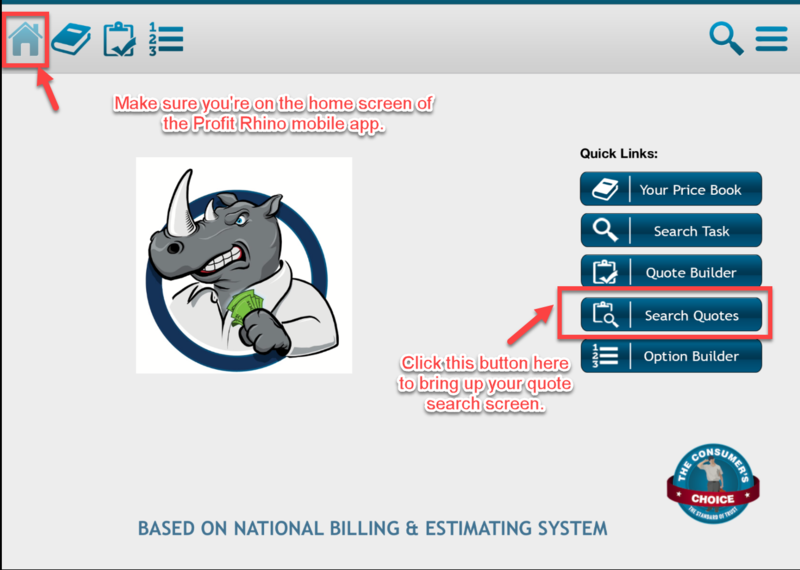 Log onto the Profit Rhino mobile application. 2nd. Build out a quick quote. 3rd. Switch off your internet connection on the pad. So what we're seeing in this image, is two fold. 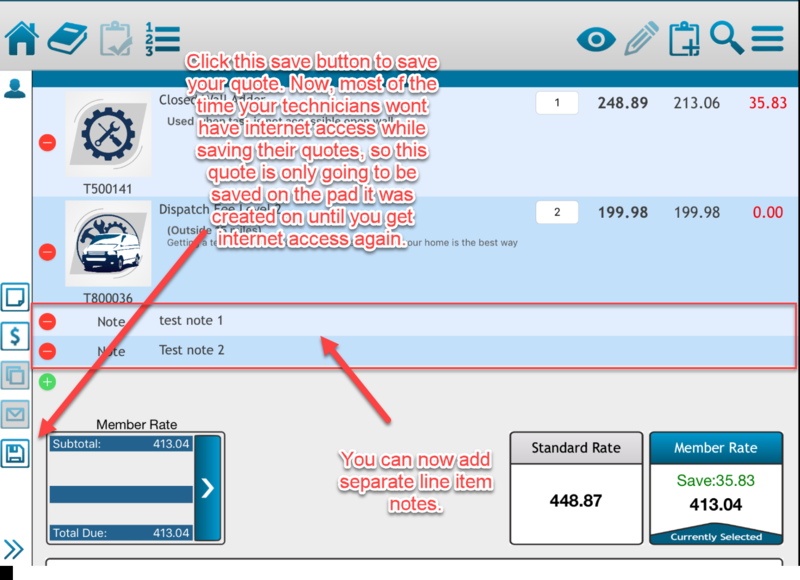 First, you can now add multiple line item notes to your quote. Second, clicking on that save button while your tablet is offline is only going to save that quote locally. What that means is, you'll only be able to access that quote from the tablet you saved it on, from the account it was saved in. As I said above, this pop-up is basically explaining that this quote won't be accessible to anyone else until you regain internet connectivity. So now that you've saved your quote offline, go ahead and turn your internet connection back on. After you've done that, you should notice that the small circular arrow symbol in the top right corner of the application has gone from red to green. What that means is that all of your saved quotes have been synced up to the database. And now that they're synced up to the data base, anyone with the permissions to see all quotes, in addition to the technician who saved it in their in the first place, should be able to see that quote, edit it, and delete it. The key difference here, is in conveyance and convenience. 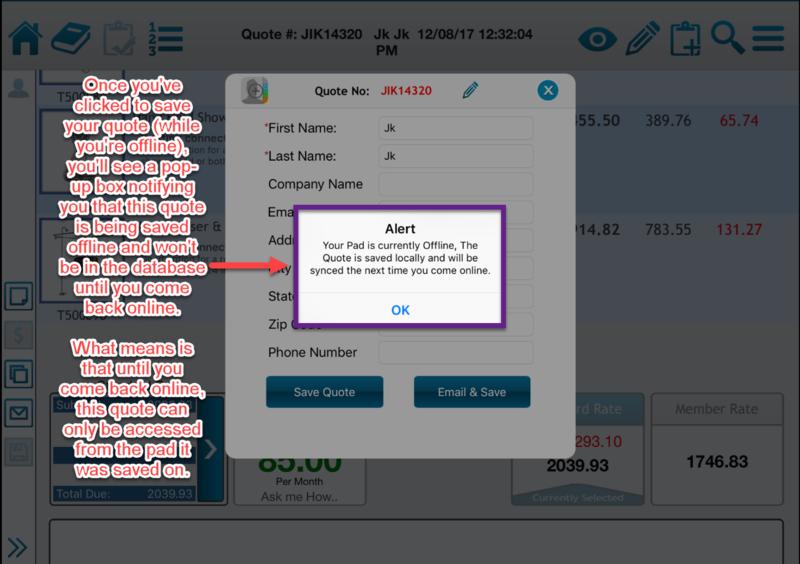 Previously in Profit Rhino, you would have needed to sync your quote manually when you regained internet connection (which is done by tapping on that circular arrow symbol) or it wouldn't get synced at all. Now, as soon as you get internet connection, your quotes will be synced up. With that being said, lets talk about searching for your saved quotes. 1st. Log on to the Profit Rhino mobile application. 2nd. Make sure you're pad has been synced up, if you're unfamiliar with how to sync your pad, click here. 3rd. Head back to the home screen by clicking on the house icon. 4th, Click on the [Search Quotes] button in the lower right of the screen. The screen you're seeing in the image above is the quote searching screen. From this screen, you'll see a list of all the quotes you have access to. So, if you have a long list of quotes saved into your database, you may find it difficult to sift through them all. We've created some functions that will help make that a little bit easier. Searching By Technician. 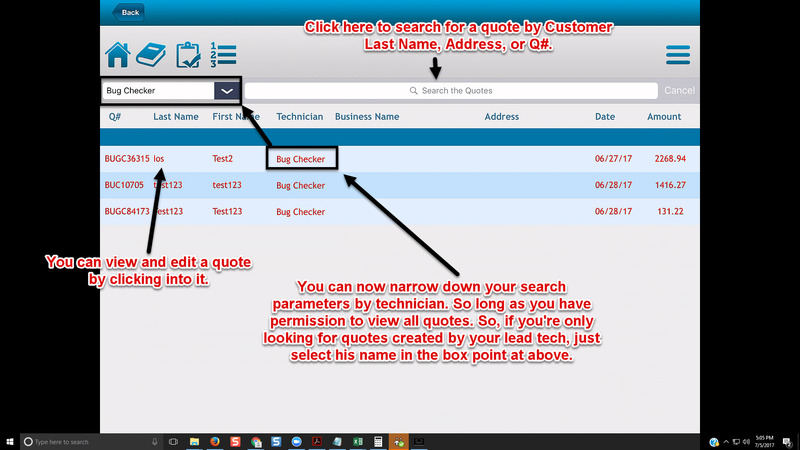 The latest function we've added to help make your quote searching experience easier is the ability to narrow down what quotes you're looking at by technician. For instance, if I only want to see the quotes created by my technician Bob Crandall, I'll click the box framed above in the image, and select his name from the drop down list. Searching by Customer Last Name, Address, or Q#. In addition to that, you can also search for a quote by the last name of the customer on that quote, their home address, or their Q# (Quote Number, the number shown on the far left in the image). These functionalities will allow you easily narrow down a quote you're looking for with as little input as possible on your end. That being said, once you've found the quote you're looking for, how can you edit or delete that quote? 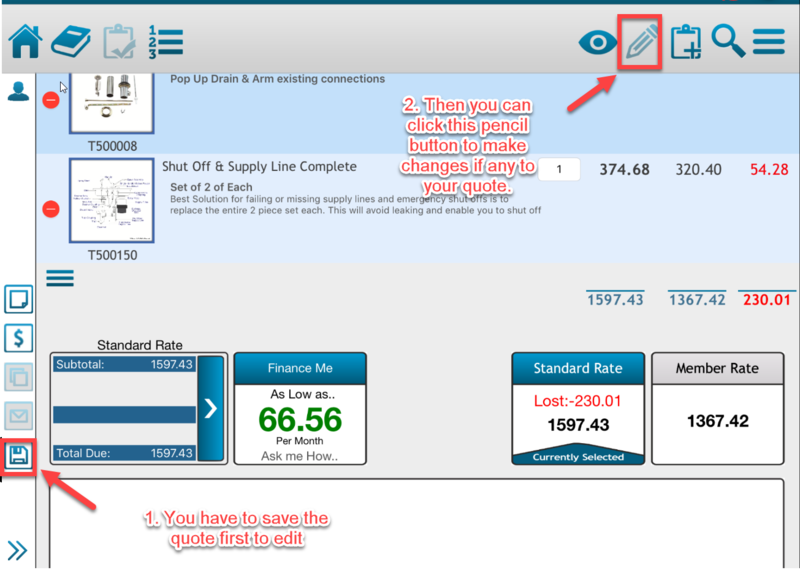 After following the steps outlined above to search for a quote, you may be wondering how to edit them. To edit the quote, simply tap on it when your finger and it should bring you to the quote builder screen with the quote opened up. Once on the quote builder screen, you'll need to click the pencil in the top right corner in order to actually enter into edit mode. So once you've clicked that pencil, you can edit the quote however you like. Whether that's adding line notes, applying payment or etc. In addition to that, once you've entered edit mode while viewing a quote, you can click that little trash can icon to delete it. So that's how you'll edit quotes in Profit Rhino, but what if I want to delete some of these to keep my invoice list from being cluttered up.